The English in the eighteenth-century, the Enlightenment world of Newton, Pope and Nash, achieved a spirituality that was Zen-like in poise, modesty and alertness. Its heritage encompasses laws of science, Augustan literature, the landscape garden, Georgian architecture, prosperous distant colonies, and meditative organ music. But scarcely an organ exists today for this music because the necessary features of light touch, deep compass, precise speech, vocal tone and equanimous balance began to disappear already in the 1840s under the impact of bourgeois Romanticism and muscular Bach. An organ was completed in 1840 in Sydney for the Anglican church at Windsor, the finest edifice in the colony, having been funded by the State before the 1824 Reform Act enshrined the principle of secularism. The organs design and craftsmanship were of the highest standard, but its metal pipes were made of the lead lining of packing cases and were particularly fragile. Nearly thirty years passed before a comparable organ was built in the Sydney region, and its style was very different. The town of Windsor stagnated through the Victorian and world war periods, and the organ in St Matthews survived largely intact although much modified. A complex restoration project was initiated by David Kinsela in 1981. Requiring five years, it was carried out by Knud Smenge of Melbourne who had worked extensively on eighteenth-century instruments in Denmark and Holland. 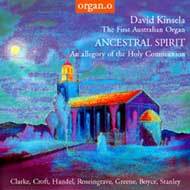 Australians are probably the only nationals who can enjoy their first organ. This first CD presents music that may have been heard by the Fathers of the NationKing George III, Captain James Cook, Sir Joseph Banks and Governor Arthur Philip.